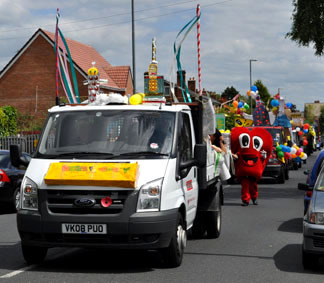 Acocks Green Carnival has a long and successful history in our area and is one of the few community organised events that can boast a street procession. The organising committee plan the details of the day well in advance and are always looking for new ideas and input from enthusiastic people. The first committee meeting for plans for Acocks Green Carnival 2011 takes place on Thursday 23rd September at Acocks Green Methodist Church on Shirley Road at 7pm. Maybe you or your organisation would like to get involved in making the day an even greater success. This is a great opportunity to put something back into our local community. Or perhaps you work with young people who might like to get more involved in promoting the carnival and encourage others to take part? This entry was posted in Events and tagged Acocks Green Carnival, Acocks Green Methodist Church, committee meeting, Community, Procession, Robert Jones. Bookmark the permalink. My name is Courtney, mom to two lovely boys, and a parttime soccer coach!